Home india How to make natural colors for holi at home? Holi is one of the most auspicious festivals in India. There is no doubt in the fact that this festival is one of most exciting of them all. It is a colour of festivals and it fills people with happiness. But there is no reason why you must enjoy the festivals in a negative light though. Chemical infused colours are unnecessary when it comes to playing with colour. Especially, when the times are changing, and people are becoming more and more concerned about various things. Also, making your natural colours is always an option. And therefore, celebrate chemical free holi this year. But why make the natural colours? The natural colours are cheap, and they are affordable. You can easily ensure that you can have an N number of holi color powder and you can have a quantity that will last you for at least 3 days of time. The pocket pinch will be less. The colours are good colours. These are natural and safe. There is no doubt in the fact that these colours will have no impact in the skin in a negative manner. Also, people must understand that the good colours will help you get through with a safe environment for you and all around you as well. Making natural colours is very easy. You can always rely on the various ingredients available at your hands. You must understand the relevance of the process. It will help you get through with the comfort. There is nothing harmful in the raw materials that will make things impossible for you. These are safe and secured in all possible ways. You can easily make natural colors for holi at home. Yes, the natural colours unlike the chemical ones are safer for you because you can easily wash these off from your skin and clothes without any problem at all. These are some of the important reasons why making natural colours can help you ensure of the best results. There are few ways you can try in order to make natural colours. We will bring out these methods to you so that you know exactly how you can make these colours. Making holi dry colours is an easy process. The cornflour is an easy way of doing the same. There is no doubt in the fact that the cornflour will help you get through with the dry colour effect. All you have to do is make a elastic slurry out of the cornflour, food colours and water. Then allow it to dry for few days. It is one important thing that will help you get through with the best results. The gram flour is another important way of making the natural holi colours. There is no doubt in the fact that the gram flour is 100% natural. It is often used as a skin cleanser for the people. And it can be used easily to make favourite holi colours of your choice. You can select from a range of different colours in accordance to your own expectations. All you have to do is make a thick paste of edible colours, gram flour and water. Wait for it to dry and then you can easily make it a dust and play with the same. Understand that there are few companies that have the natural holi color powder with them. Of course, these natural colours are so produced that it doesn’t harm the people playing with them. It will help them with the best results for themselves under any condition. No matter what happens one can easily get these colours as these are widely available. Beet roots are naturally red vegetables. This vegetable is highly pigmented in the red colour. It is one essential reason why you can easily get the colour out of these vegetables. You can easily chop these up and grind them in a mixer to make it into a pulp and to excrete the juice as well. Nevertheless, one must understand that they should concentrate the same by boiling. Once done, you can easily mix it with water to make good colour out of the same. No matter what colour you want, there are flowers available in the same colours. All you have to do is take the petals out of these flours and then dry them completely. Then you will have to completely grind them along with corn flour or besan and get the colour you desire for yourself. You can also make the pulp out of the flower petals and then use the same in water to make natural water colours that will help with the wet holi. If you want the natural green colours to come live in front of you, then there is an easy way out for the same. Take good green leafy vegetables. And then you will have to add the darkest green leaves of flowers in the same. Then you will have grind them with water and make them into pulps. Then you can choose to mix them with the cornflour or the flour or the besan for the best results. It will help you in the best ways. You can also come across with the herbal gulals. These are available from different stores and places. These are organic and safe for the people in more than one possible way. Of course, with these herbal gulals, you will be able to play a safe and sound holi without having to make much effort on the same. The mehendi leaves will be great options for you. These will be natural and safe in all the ways. The tea leaves will do the same miracle if you want the black coloured water of course. 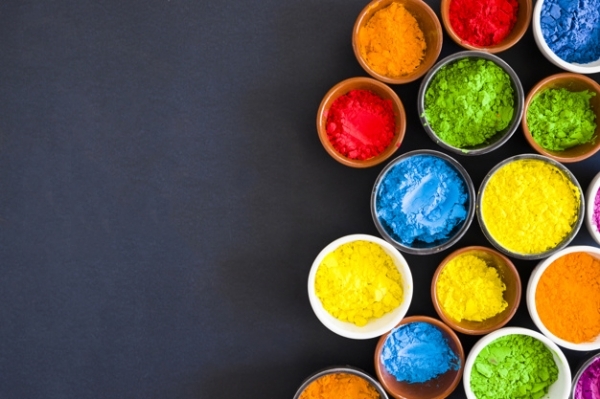 These are some of the most important ways of how to make natural colors for holi at home.